Scottish scientists have come up with the first-ever map showing hotspots for new viruses, including the one responsible for Ebola transmission, and passing from bats to humans. The map shows risk levels due to a variety of factors. These include the presence of different bat viruses found locally, increasing population pressure and hunting of bats for bushmeat. According to the map published on Monday in The American Naturalist, a peer-reviewed publication, the marked areas are at high risk from bat viruses “spilling over” into humans, and thus resulting in new emerging diseases. The highest risk hotspots for zoonotic bat viruses are West Africa, sub-Saharan Africa and South-East Asia. This is outside the endemic range proposed by previous studies, but has since experienced the largest scale outbreak of Ebola seen yet. The research for the map, which is based on the data published between 1900 and 2013, was conducted by Kate Jones, chair of ecology and biodiversity at University College London’s (UCL) biosciences department and Zoological Society of London (ZSL) and Liam Brierley, a PhD student at the University of Edinburgh. The study states that approximately 60-75 per cent of the reported human Emerging Infectious Diseases (EIDs) are “zoonotic”, where infectious diseases in animals are naturally transmitted to humans. The researchers chose to study bats in particular as they are known to carry multiple zoonotic viruses and are the suspected origin of rabies, Ebola and SARS. “We’ve identified the factors contributing to the transmission of zoonotic diseases, allowing us to create risk maps for each. For example, mapping for potential human-bat contact, we found sub-Saharan Africa to be a hotspot. Whereas for diversity of bat viruses, we found South America was at most risk. 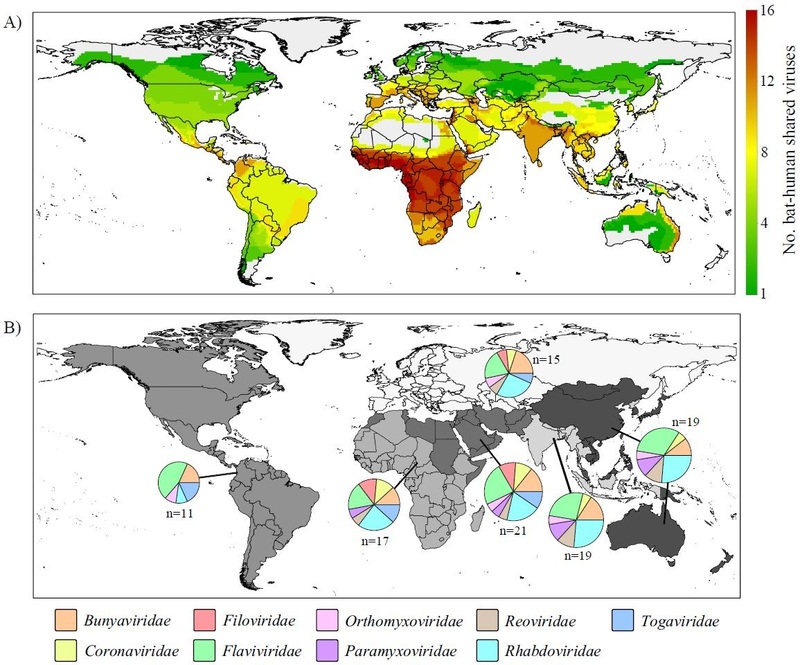 By combining the separate maps, we’ve created the first global picture of the overall risks of bat viruses infecting humans in different regions,” Jones said. Information on the viruses carried by bats was collated by scientists at Western Michigan University and EcoHealth Alliance (both in USA), who analysed over 110 years of data spanning 33 zoonotic bat viruses across 148 bat species from 453 literature sources. These results were then modelled by researchers at UCL and ZSL to find patterns and drivers for bat-human virus sharing and map the findings onto cells across the globe to identify areas at risk.